Leatop Plaza, location of SCP-2745. Special Containment Procedures: The floor containing SCP-2745 is currently under use as a Provisional Observation Post д, under the guise of Foundation front "Pacific Constructs International," due to the presence of anomalies E-9400 and E-3149 set in the Zhujiang East Road area. No further containment procedures are required; requests for increased surveillance are under consideration. 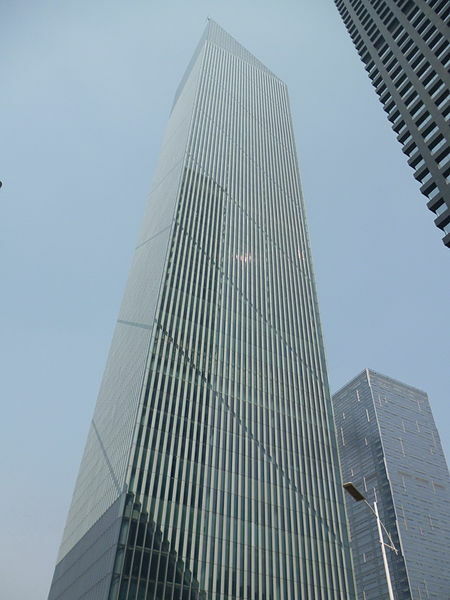 Description: SCP-2745 is the corner of a room containing extra-dimensional properties, located in the 43rd floor of Leatop Plaza in Guangzhou, China. Specifically, SCP-2745 is centralized in the Waterfall (瀑布) Conference Room, and is designated as the north-western corner of said conference room, furthest away from the room's entrance. When SCP-2745 is approached by any subject beginning at approximately 0.6 meters from SCP-2745, the subject will be able to continue walking forward, appearing as if they are decreasing in size while simultaneously walking away. Outside observers will report that subjects that continue to walk forward appear as though they are walking in place, and the subject's reduction in size correlates with the total distance the subject has walked towards SCP-2745. Spectators also express confusion in regards to their depth perception, claiming that they perceive the subject as increasing in distance from them despite the lack of space. Other observers have compared observing SCP-2745 similar to viewing an object through concave lens, producing a smaller image of the subject. Subjects that continue walking toward SCP-2745 are observed to continue moving further away until becoming invisible, at a threshold of 195 meters. Interaction with subjects within SCP-2745 by outside observers is difficult, as approaching the subject with any object will cause said object to be affected by SCP-2745. For example, approaching a subject within SCP-2745 with a long pole will require the same amount of distance the subject has walked to allow physical contact. Adding to this is the fact that communication by means of radio communication is still possible, leading researchers to believe SCP-2745 possesses properties unrelated to the growth and shrinkage of physical matter and is related to visual perspective. Subjects walking "into" SCP-2745 report that they are able to continue walking forward, while their surroundings increase in size corresponding to how far they have traveled. It is currently unknown how exactly the subject's size, perception, or location in space-time is affected. Stable threshold has been created. Ingress acceptable. Note to future Observation Post: entities within threshold are not hostile, likelihood of threshold collapse 10% by 2150, at least. Do not attempt recovery of humans, and Perhacs-3 does not require extra containment. Temporal anomalies should NOT be present. I've already used them to begin Alizarin's process. DO NOT ENTER THE CORNER IF ANY ARE DETECTED. Paradoxes are highly volatile. Alizarin should be seen at 1932 if they're careful, 1933 if not. Interview and assessment of Linda Perhacs, currently residing in Topanga Canyon, California, has revealed no relation to anomalous events or persons. SCP-2695 and SCP-2825 are to be considered related to SCP-2745 due to POI-089, "Mark Pritchard". Exploration Log 2745-PCN2: Agent Wallis volunteered to partially explore SCP-2745 on 8/21/20██. After a psychological evaluation and psychotherapy in regards to Agent Wallis' mental stability, concerning their recent diagnosis of Bipolar disorder while under Foundation employment, HMCL Clark consented to exploration of SCP-2745. Nothing new after walking for about 3 minutes. I entered from the side of the corner closest to the window— it was pretty cool, watching it stretch bigger and bigger, could see all the scuff marks and, hm, the grazes on it. Eventually, I had walked so far that I could only see the black frame of the window and the grey and white stains in the ground. I think I was walking into a ridge in the room's tiling, as my perspective on the room got smaller. And, uh, I expected to start dust particles or something up close while moving in— or, moving towards, the center of 2745. But there was nothing but the window, the wall, and the ground. It didn't feel like I was moving, it was more like watching myself walk forward in a recording, the camera constantly moving in. Eventually, my vision was left with only the black window frame, the white plaster, and the grey floor tile. There was a portion of the walk where I could see the grooves in the floor, like miles of torn-up canyons— but like I said, I couldn't really interact with it. It was more like I was walking above it. About 2 more minutes of the walking until I saw something. It took another minute for me to reach it, and it was an article of children's clothing. It got me thinking about, what was his name, Blake's son. But yeah. I saw a T-shirt on the ground. Red, with a logo. It was kinda torn up, but it wasn't wrinkled. It was completely flat, like someone took the time to iron it to the ground. I noted it and kept walking. I had been gone for twenty more minutes. I had already lost contact with the guys back at the Observation Post. I was being unreasonable, and I should have turned back. But… hm. I can talk about that later, it didn't have anything to do with the skip itself. I'm sure about that. But during those 20 minutes, I could hear a woman singing and a guitar, about every five minutes or so, I managed to record that. It was after the third time I heard those sounds, that only then I noticed I was walking in a huge hall, with white arches and pillars, with white beds. White sheets, white bedframe, white pillow. The kind of white that angers people if you spill something on it. And the hall was empty, for the most part. But not even half a minute of walking, and I can make out some clothed figures, shuffling slowly between the beds. Of course, there were more humanoids inside of the beds. I'm sure they were just normal people, but you know I brought back samples for confirmation. Exploration Log Addendum 2745-PCN2: SCP-2745-1 refers to several autonomous mannequins residing in a spatial area within SCP-2745. Agent Wallis reported a total of 20 instances of SCP-2745-1, all consisting of polymer normally used in store mannequins. Interaction of SCP-2745-1 is exclusively limited to unconscious human subjects inhabiting SCP-2745, particularly subjects that occupied beds noted by Agent Wallis . SCP-2745-1 does not appear to be sapient, and acts in a predictable manner. Instances of SCP-2745-1 were noted to wear different sets of clothing when interacting with human subjects. Actions towards subjects included sitting next to the subject, holding hands, checking their pulse, and adjusting the subject's bed sheets. Wallis has also mentioned watching one SCP-2745-1 speaking to a subject, but was unable to explain further. Samples of human subjects within SCP-2745 has confirmed no matches with living or dead persons. The following is a sample of Wallis' recordings from within SCP-2745, while approaching instances of SCP-2745-1. Samples of music appear to feature Linda Perhacs as the singer, though the album "Parallelograms" does not feature the samples recorded. So I kept walking past the beds, through the hall. Three and a half more minutes of walking, and the music I was hearing before was coming back, stronger. I'm not sure if there's some sort of visual effect to 2745 or if it was just what I was seeing itself, but I could make out the shape of a human torso— arms at it's side, swaying a bit like it was underwater. I was handling being in there pretty well, but this threw me off. It was the lady on the CD albums that recon had found earlier, Perhacs was it? She was just smiling with her eyes closed, her hair draping her front. I realized that she had to be at least 100 feet tall— sorry, 30 meters, from her head to her torso. The rest of her, if there was any, looked firmly fixed beneath the ground. And then the ceiling— the sky broke. I watched it begin to turn red. Not a frightening red, but a warm red, like a car's brake-lights in the dark. And the video recording won't show it, but I KNOW I saw some kind of structure overhead, some huge bridge. I'd believe that sensation of seeing something like that was an empathic effect, but I wasn't focusing on that. Above Perhacs, I could see dashes of black in the red, and it was MORE people. Just random people you'd see on the street, falling at terminal velocity. I closed my ears and looked away, expecting to hear them hit the ground, but nothing. I turned back to Perhacs, and it was like someone had paused a tape. Some bodies were floating downwards, others had already landed on beds. None of them were damaged, or looked like they had just slammed into the ground. Meanwhile, Perhacs, she was cradling 3 of them. Somewhat motherly, but more like she was holding a lover's head. She just had the look of someone that could see something else in a person, something that we don't just miss, but fail to detect. Melancholy comfort, I would say. I walked past the bodies on the ground and in the beds, but I didn't touch them. The way I came across these "areas" in 2745, it felt like a presentation of events. I didn't want to turn back yet. So… give me a second… 8 more minutes of walking, and I hit a wall. Endless stretch of chalky white wall. I went to the left, holding it. By that point, that's where Greenwood saw me coming out. Wouldn't outrule the possibility of re-entering 2745 from the building's wall, rather than walking straight into the corner. …I'm not crazy. Don't think I am. But seeing myself only move forward, with the end being "that." And you better not— look, this isn't just me being caught up in some mind-affecting anomaly's "THE LIGHT COMETH, OPEN YOUR EYES" type of response, alright Selway? I'm being as sincere as I possibly can right now. I really believe this is something that more people, more people HERE, should see. Working here has a toll. I already live with my own problems, and everyone I work with knows that. But there's a lack of faith that people need to constantly kick themselves for, something to keep them from offing themselves. Maybe this could be an example of that. Maybe a bit of reassurance that there's an end, past all the endings we've already gone through. Or maybe I just let this one anomaly get to my head. I dunno. It might have been the other two skips, reading their summaries. But this was— It was reassuring to me. It was almost "normal". Incident 2745-B [8/21/2010]: 4 citizens have reported witnessing a towering "shadow" appearing near Leatop Plaza. After Provisional Observation Post recon investigated surveillance near Leatop Plaza following Agent Wallis' exploration within SCP-2745, a humanoid of similar height to Leatop Plaza and identical to Agent Wallis in appearance could be seen pressing against an invisible barrier, and walking in place while holding one hand against it, corresponding to how they exited SCP-2745. Researcher Olsen has suggested that a portion of SCP-2745 may extend outside of the floor it is contained within. Class C amnestics were distributed accordingly; Researcher Olsen has recommended updated containment procedures, due to SCP-2745's likely multi-dimensional and memory-affecting impact on nearby civilians.